Collecting the 50 state quarters is a great way to get started in coin collecting! 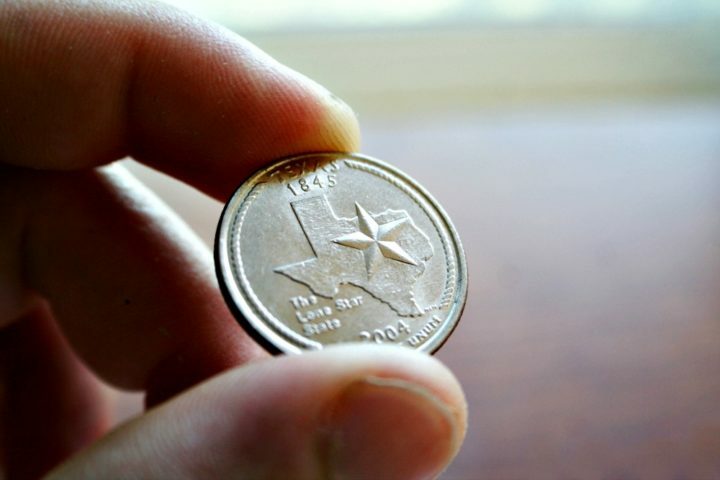 But the truth is the statehood quarters are a coin set that is fun for everybody — whether you’ve been collecting coins for years, or if you’ve never collected coins before. The biggest reason for this is because these quarters can be found in your everyday pocket change — so it’s very easy to complete a circulated set of 50 State quarters for face value! Are you collecting the 50 state quarters? I’m one of the estimated 147 million people who are collecting the 50 States Quarters series coins. What does it take to complete the set on your own? What are the states, and what years were they released? How should you organize and store the state quarters in your collection? Do you have to collect both Philadelphia and Denver coins for a complete collection? How much will it cost to complete the entire collection of 50 States Quarters coins? It took 10 years for the U.S. Mint to produce hundreds of millions of coins with each of the unique designs in the 50 States Quarters program. The statehood quarters program began in 1999 and continued through 2008. These endearing coins show us our country in all its colorful and amazing diversity. Cultural, historical, and societal icons, places, events, and people all appear on the 50 state quarters. This is one reason why the state quarters still resonate with all kinds of people — and likely will continue doing so for decades to come. The 50 state quarters were released into circulation in the order that the statehoods came into existence. The date on the left is when that state quarter was released, and the date on the right is when that state came into statehood. See what each state quarter looks like and the unique characteristics on each state quarter. Should You Collect 1 Or 2 Quarters For Each Design? You may be wondering, should you collect both Philadelphia and Denver minted quarters for each design? Or is just one example of each design enough? On the one hand, collecting one example of each Philadelphia and Denver design gives you examples of all the circulating 50 State Quarters. On the other hand, because the designs are the same on the Philadelphia and Denver quarters (except for the mint mark, which is a “P” for Philadelphia coins and a “D” for Denver), it suits a lot of people, including myself, to simply collect one nice example of each design, regardless of mint mark. The second example above is typically called a “date set.” These are easier to collect by basic virtue of the fact there are fewer coins to find (or purchase) in order to complete a collection. Therefore, date sets are also less expensive to complete. How Much Does It Cost To Build A Complete Set Of 50 State Quarters? $60 and up for collections including 2 examples for each state design (50 Philadelphia mint coins and 50 Denver mint coins). 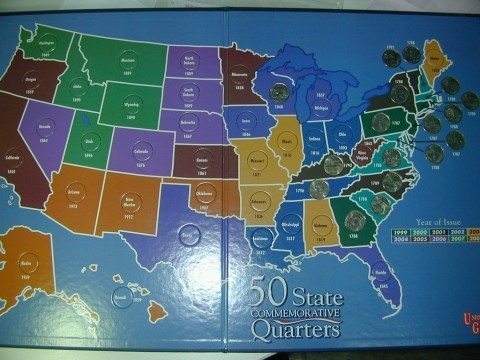 To store your complete 50 States Quarters set, you’ll want either state quarter map boards or state quarter folders (or albums). They can be found at most coin dealers’ stores. 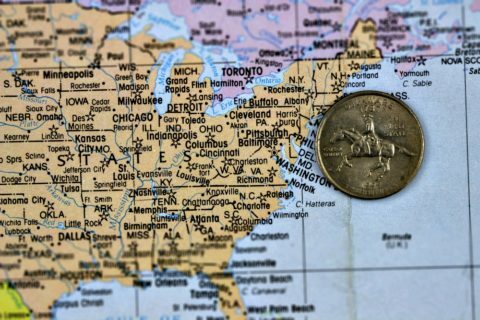 The easiest way to collect state quarters is to buy a 50 States Quarters map, which is specially designed just for these commemorative coins. The map of the United States has an illustration for each state and an opening to place the corresponding state quarter. Quarter maps are also a great way to get kids into the hobby! 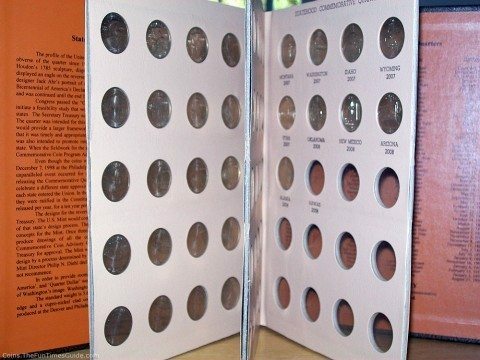 If you’re a little more serious about coin collecting and you want your state quarter collection to include all of the quarters, then you’ll probably want to get a 50 States Quarters folder. Cardboard coin folders are the least expensive way to store your coins. They can be easily found at most bookstores and coin dealers — and they generally cost less than $10 each. 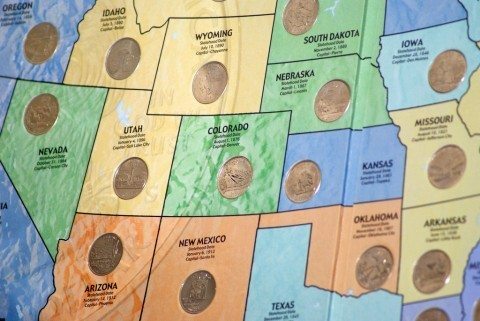 The biggest difference between state quarter maps and state quarter folders is that the state folder (or album) doesn’t have illustrations of the states. But it does have 2 corresponding holes for each state instead of 1. One is labeled “P” and one is labeled “D” — because 2 different mints produced these coins. Those with a P mint mark were made at the Pennsylvania mint. Those with a D mint mark were made at the Denver mint. 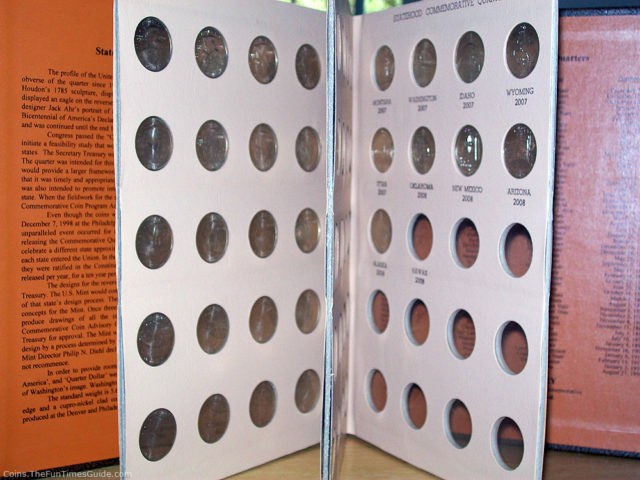 Coin folders are best if you’re collecting one example of each state quarter from each mint facility. 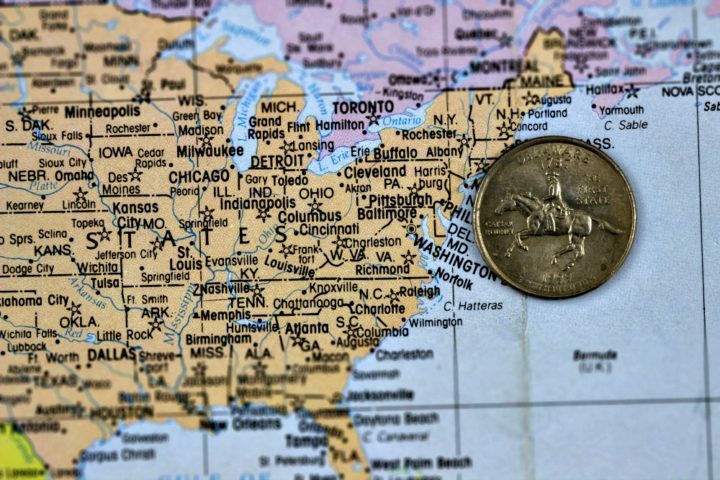 Coin maps are best if you’re only saving one of each state quarter, regardless of the U.S. mint facility it was made in. When the US Mint was still releasing 50 State Quarters every year, I used to buy the new quarters in proof sets. A proof set is an assemblage of collector coins that the US Mint sells each year. A proof coin is a struck by specially prepared dies on polished coin blanks, resulting in a beautiful, virtually flawless coin that contains mirror-like surfaces and frosted designs and lettering. 5-piece copper-nickel clad 50 States Quarter proof sets — These contain only proof examples of the clad quarters you’ll find in circulation. Most of these 5-piece proof sets sell for less than $7 each. 5-piece silver 50 States Quarter proof sets — This set includes each of the quarters from a given year in a 90% silver format. Silver 50 State Quarter proof sets are generally priced between $10 and $30 each. Regular proof sets with 50 States Quarters — If you want proof examples of the copper-nickel clad quarters and all of the other circulating coins that were made that year, then you’ll want to buy the “regular” proof set. A regular proof set contains the 5 proof quarters plus a cent, nickel, dime, half dollar, and dollar coin (the latter for proof sets made from 2000-2008). Silver proof set with 50 States Quarters — This pretty much includes the same basic coins as described in the previous “regular” proof set except the dime and half dollar are — like the quarters — made from 90% silver. Proof sets are usually packaged with coins made at the San Francisco, or “S” mint (there are some rare exceptions). Current-year proof sets can be purchased directly from the United States Mint. Older proof sets, like those containing 50 State Quarters, can be bought from your local coin dealer, online coin dealers, or on auction websites like eBay. 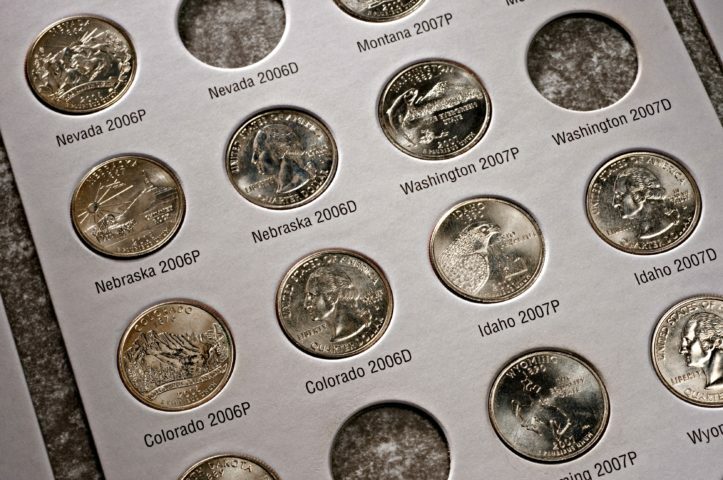 Another fun way to collect state quarters is to buy them in uncirculated mint sets. These special collector sets are packaged and sold by the US Mint and since 1959 have included one uncirculated example of each circulating coin from each mint striking them — generally the Philadelphia Mint and Denver Mint. Most of the uncirculated mint sets made during the 50 States Quarters can be bought today for less than $15 to $20 each, though a couple are a little more expensive because they’re scarcer. If you want to buy older mint sets containing 50 State Quarters for your coin collection, you’ll need to buy them from a coin dealer or on an online auction site. Interested in buying new uncirculated mint sets? You can buy them directly from the US Mint. You’ve probably seen 50 State Quarter holiday ornaments, state quarter spoons, colorized 50 State Quarters, and even first-day covers with postage stamps. So many people ask me if these state quarter gifts are valuable. I always hate to break the news that these novelty coin items are almost worthless from a numismatic perspective. There were just too many of these products made — and there aren’t enough collectors who want them. So, no, unfortunately you’re colored Ohio quarter isn’t valuable. Neither is your California quarter spoon, Delaware quarter Christmas ornament, or your Florida quarter first day cover. However, that does NOT mean that these aren’t really neat items to collect if you like them! As I tell so many readers at The Fun Times Guide… don’t collect coins for what they’re worth — collect the coins you like. Coin collecting isn’t meant to be a get-rich-quick pursuit. It’s a hobby to be enjoyed for what it is: collecting coins. If you happen to make some money when you sell your coins, then great. It’s icing on the cake. But if you just collect the coins you like, you’ll have more fun! So, if you want to collect all 50 of the 50 State Quarters spoons, go for it — it may be harder to complete than you think. Good luck.